Welcome to another Feminist Friday column! That part of the week where we gather around a handful of videos we are crushing on at the moment. This week we’re checking out 3 films – 2 documentaries and 1 narrative – that premiered at the Sundance Film Festival. The annual event held in Park City, Utah, becomes the mecca for filmmakers each January as it sends networks, studios and streaming platforms into a bidding frenzy for what will be the hottest films that year. It is also the festival that is said to launch a filmmaker into the next stratosphere of the film industry, as people like Ava DuVernay can attest to. The three trailers this week are all films about trailblazing women, made by women, and exploring intersectional feminist themes that are centered around identity, politics and journalism. 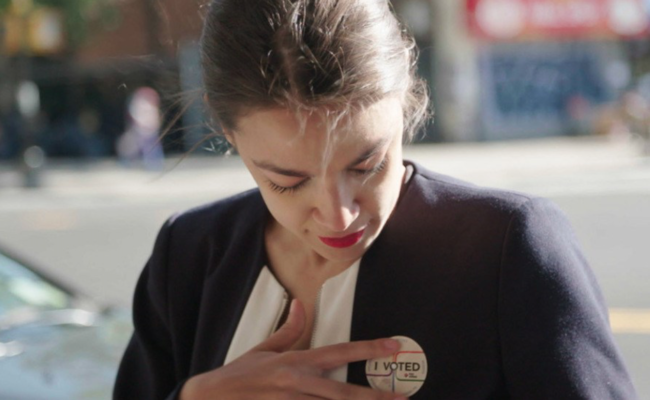 The first is a film by Emmy Award-nominated filmmakers Rachel Lears and Robin Blotnick called ‘Knock Down The House’, which follows the journey of 4 progressive Congressional candidates in the lead-up to the 2018 Mid-term elections. One of them is Alexandra Ocasio-Cortez, who not only won her election to represent New York’s 14th District, but at 29 has become the youngest person ever elected to the US Congress and has been the talk of the town especially by the right-wing media because of her democratic socialist views. The second film we’re excited to feature that premiered at Sundance comes from award-winning producer and director Janice Engel. Her film ‘Raise Hell – The Life And Times of Molly Ivins‘ is a timely film in a political environment where we are seeing the delegitimization of journalists and journalism, as well as the shuttering of large news media platforms which should worry us all during the Trump administration which likes to cry “fake news” at stories criticizing the current president. Molly Ivins was a trailblazing, fearless journalist whose columns about politics were syndicated to papers worldwide. She was known for skewering politicians and pointing out injustices to the public. She used her razor-sharp wit and fearless work ethic to call out corrupt politicians who were backed by corporate lobby groups (sound familiar?). “Molly was also a trailblazer for female journalists. At the height of her popularity, nearly 400 papers carried her column. She appeared on national television and radio, lectured all over the country and encouraged her constituents to raise hell and fight for freedom. Molly was a tall drink of water that quenched a thirsty populace who, isolated by geography and politics, knew they were not alone when they heard her voice. A fighter against injustice until the very end, breast cancer took Ivins out of the game way too soon,” says the description on the film’s Facebook Page. The final film we want to talk about is ‘Clemency’, from writer/director Chinonye Chukwu, starring Alfre Woodard, Richard Schiff, Danielle Brooks, Aldis Hodge, Wendell Pierce, and Richard Gunn. Years of carrying out death row executions have taken a toll on prison warden Bernadine Williams (Alfre Woodard). As she prepares to execute another inmate, Bernadine must confront the psychological and emotional demons her job creates, ultimately connecting her to the man she is sanctioned to kill. The film has yet to announce distribution and while a trailer hasn’t been released, we wanted to share a video from The Hollywood Reporter speaking with Chinonye and the cast of the film at Sundance where they talk about the central themes of the film. It should also be noted that the filmmaker has made history by becoming the first Black woman to win the Sundance Film Festival’s Grand Jury Prize for her U.S. Dramatic entry. Watch below to learn more about ‘Clemency’ and why this is an important film to look out for as distribution release dates are announced.